After a relaxed morning waiting for a breeze to build, teams at Lendy Cowes Week were thoroughly tested today by a series of wild fluctuations in the wind that accompanied short showers that passed over the race area this afternoon. Lulls saw to wind drop to as low as three knots while some gusts topped 20 knots, while the direction at times swung through 90 degrees. Today was also Lendy Ladies Day, a celebration of the many successes of women in sailing. More than 30 per cent of competitors at Lendy Cowes Week are women and around 100 women helms were racing today. Among them were class winners on board the S&S41 Winsome in IRC Class 5, the Mustang 30 GR8 Banter in IRC Class 7 and the X4.3 Baby X in Cruiser Division A. In IRC Class 6 Amanda Marino’s Half Tonner Chimp was defending the Royal Southern YC’s Ariel trophy for the best placed woman helm. However, a fourth place today saw her team fall just outside the podium this year. This is a tough class to win this year, thanks to Giovanni Belgrano’s extremely successful pre war classic yacht Whooper. Today she finished with a commanding margin ahead of Toby Gorman’s Sigma 33 Stan the Boat and Simon Cory’s Cory Yachts 290 Icom Cool Blue. Harry Heijst’s S&S41 Winsome, which is helmed all week by Laura Dillon, won IRC Class 5, ahead of overall class leader, Phil Plumtree’s Half Tonner Swuzzlebubble and Andy and Anne Howe’s J/97 Blackjack ll. “It was a great race – a good length and very enjoyable – even though the wind was very shifty and up and down from 5 to 21 knots,” says Dillon. “Harry Heijst, our owner and navigator, made a great call in the second half, asking me to sail low to the mainland shore. We got out of the adverse tide there had a 30 degree wind shift that favoured us – that’s when we got past Swuzzlebubble, our main competitor.” It was a performance that earned Dillon the Ariel Trophy. A small band of rain moved across the start area as the Daring fleet was getting away, leaving a five minute belt of lighter and more fickle winds in its wake that split the fleet. With the tide against them, the back markers in the Daring class failed to clear the line before the start of the J/80 and Sportsboat classes. By this time the breeze rapidly built back to 10-12 knots, temporarily shifting right to a more westerly direction. The two cannons for an individual recall were sounded at the start, but no boats turned back. Fiona and Malcolm Thorpe’s King Louie, and Jon Powell’s Betty, were closest to the inshore end of the line. However, Chris Body’s MockingJay took an early lead ahead of Ray Mitchell’s Checkmate after King Louie grounded on Grantham Rocks as the fleet short tacked past the Green. Betty crossed the line first, but had to take a penalty for a rule infringement, which lifted MockingJay to first place, while Checkmate took third. The lowest rated boat in the Sportsboat class, Boss Hog’s modified Cork 1720 Spider Pig, took line honours in today’s race. Malcolm Roberts’ Ker 9m Sunshine crossed the line 13 seconds later and retained second place on corrected time ahead of Paul Lewis’ Cork 1720 Rum n Cork. There was a short postponement when the wind went very soft after the Sunbeam start and boats failed to make ground against the tide. When the breeze returned a whole host of boats sailed west, including Redwings, Mermaids, XODs, Flying 15s and Victorys, making a great sight. The Redwing class had returned before their one-minute signal, but many were not well placed for the start, being too far down tide and moving too slowly. Nick Woolgar and Olav Cole’s Goose started prematurely and returned to start correctly. Hugo Cuddigan’s Capella ll popped out mid line ahead of the fleet at the start, although Jonathan and Sarah Nainby-Luxmoore’s Snowgoose ll held an advantage further inshore. The most inshore boat, James Wilson’s Quail, would have looked good, but was five seconds late at the gun. Nevertheless, Wilson had clean air and benefited from the inshore advantage. However, John Raymond and Matt Alexander’s Harlequin won the race, taking their fourth victory in a row. Capella ll was second, and Thomas Montagu Douglas Scott’s Siskin third. Two former World Champions have been fighting it out at the front of the Flying 15 fleet all week. Today the fleet was early at the start, with Rupert and John Mander’s Men Behaving Badly forced into an early dip before gun, but several boats were premature and had to return. This left Men Behaving Badly and Sam Chan’s Freefire20 looking best placed, with the latter enjoying an advantage inshore and to windward, allowing him to hook into the south-westerly wind shifts marginally earlier. However, Charles Apthorp’s Fourwinds, sailing with his 16-year-old son Timothy, was ahead at the finish, with Mike Dixon’s Fflashback third. The Manders and Apthorps are now tied on points, with two wins and two second places each. 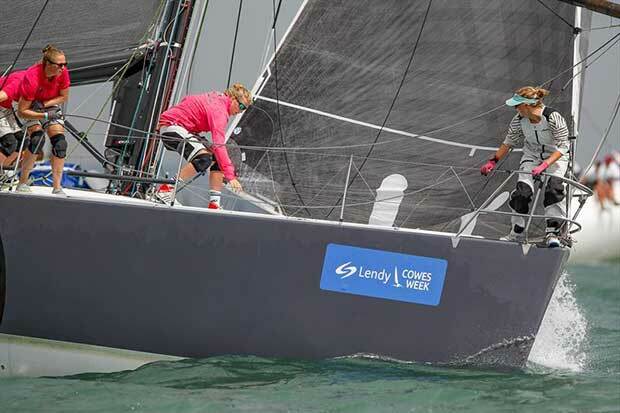 Today was also the final day of a short series for a number of classes that have been enjoyed two or three races per day over the first four days of Lendy Cowes Week. Kate and John Greenland’s JDog won the J/70 short series by a nine-point margin ahead of Clive Bush’s Darcey, with Ali Hall’s Sceptre taking third place. John Pollard’s Xcellent won all but one race in the SB20 Grand Slam to take a commanding victory. Charles Whelan’s Breaking Bod was second and the Waha Waite McLean Youth Team’s Spongbob third. Sam Laidlaw’s Quarter Tonner Aguila put in a similarly impressive performance, winning every race to finish the series 12 points ahead of Julian Metherell’s Bullit. J Welch’s Great Bear lV took third place. The HP30 class saw a tighter battle between Malcolm Wootton’s modified Farr 30 Pegasus Dekmarx and Glyn Locke’s Farr 280 Toucan. Locke showed very consistent form, scoring second places in all but one race, however a first and a fourth today for Wootton secured overall victory by two points. Richard Woof’s J/90 Jo 90 took third place. 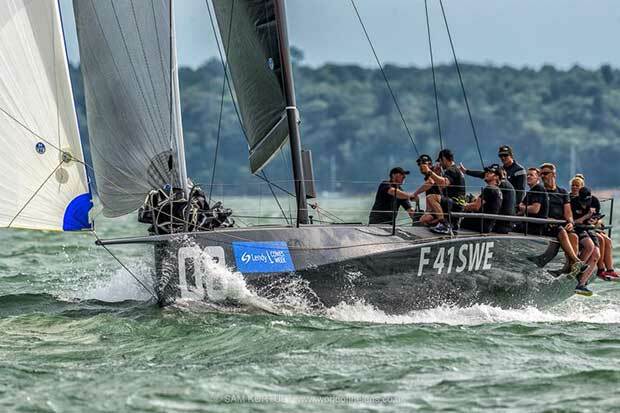 In the Fast40+ fleet two firsts and a third place lifted Niklas Zennström’s Ràn into first overall, two points ahead of Peter Morton’s Girls on Film. Bas de Voogd’s Hitchhiker sailed a consistent series and took third overall. These classes will also continue racing for the rest of the week for their overall Lendy Cowes Week championships.